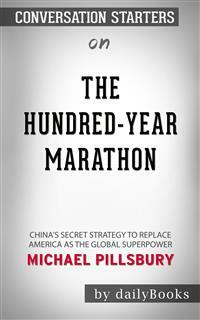 The Hundred-Year Marathon: China's Secret Strategy to Replace America as the Global Superpower is a book written by Michael Pillsbury who says that after many years of believing that China is America's ally who deserves assistance in its development efforts, he now thinks China had been stealthy and cunning all these years. Today, China is America's greatest security threat. The book was published in 2015. Pillsbury is a former senior national security officer who has served several American presidents as far back as Richard Nixon. He also served in Barack Obama’s administration.